It applies to blow various LDPE, HDPE and LLDPE plasticfilms, widely applying to food, fruit, clothing, textile, vesttype bag and etc. Packing of civil industrial products. Mode SJ45-50 squeezing machine is adopted rotatory die head,machine tube is adopted 38CrMoAl,having the best hardness and corrosion-resisting performance after nitrogen treatment and precision processing. 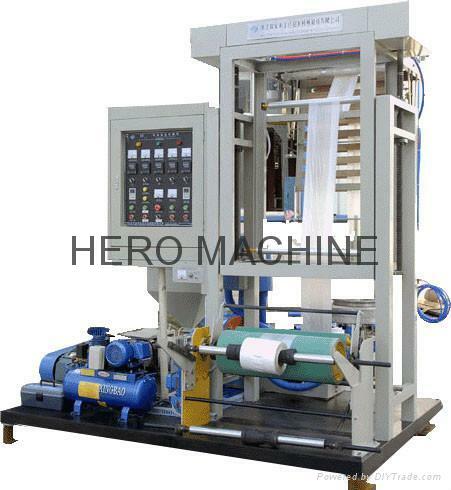 FM-600 auxiliary machine can adjust and operate freely within the range of 700mm in accordance with the technological demand of different materials, and having package board mechanism which can make vest type bag. Rolling up device with double-drawing in and do-uble cutting ope, its power is adopted moment motor, with friction plate,it can keep suitable tension, drawing in and rolling up in good order, easy to change roll.